As we enter debate season, week three, there was not much of a rush from pollsters to set baselines for comparison before Tuesday night's town hall tilt in Hempstead. In any event, there was not the same flurry of poll releases that we witnessed prior to the first debate in Denver. That is largely a function of the small window pollsters had between the vice presidential debate last Thursday and tomorrow night's second presidential debate. Things may have been somewhat slow on Monday, but there were still eight new polls from seven states. And as has become the trend over the last week and a half to two weeks, the data continues -- with rare exception -- to show movement toward (though not without some leveling off) Mitt Romney. In a post-debate period where the polling in Colorado has settled in around a level just under half a point for Romney (the raw average), this Gravis poll is a bright spot for the Obama campaign. Perhaps even better for the president is the fact that the poll-over-poll comparison with the last Gravis poll -- also post-debate -- shows some movement back toward Obama. A three and a half point deficit is now a two and a half point lead. As of now, those two Gravis polls basically serve as the bookends on the range of polling that has come out of the Centennial state since the debate. Of course, this is probably the lone bright spot for Obama in today's series of surveys. There are a couple of notes on Florida. First, Today's Gravis poll is an exact mirror image of the PPP survey released a day ago. Second, Mitt Romney has led every (completely) post-debate poll in the Sunshine state with the exception of one; an Obama +1 in the most recent Marist/Wall Street Journal/NBC poll. 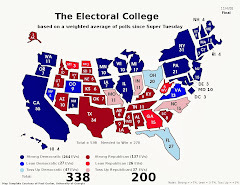 The raw, post-debate average has Romney up by nearly two points, and though the FHQ weighted average is lagging, it is gradually tracking down toward either a tie or the Romney side of the partisan line on the Electoral College Spectrum below. If the Hawkeye state was underpolled before the first debate in Denver, it is really underpolled now after the debate has in part led to an overall narrowing between the candidates in the latest survey data. If the margin overall is tighter, then Iowa is not only inching closer to the partisan line between the two candidates' groups of states, but is also becoming more consequential in the race to 270 if all or some of the states below it on the Spectrum slip across the line into Romney's column, thus increasing the governor's paths to the winning threshold. The scant evidence that we do have following the first debate suggests that Obama is ahead by the smallest of margins there. Recent polling in the Show Me state has indicated a closer but not necessarily competitive race there. And while the Wenzel Strategies poll shows a wider margin between Governor Romney and President Obama, it is a gap that has closed slightly -- a nearly 20 point Romney lead has dropped to 14 points -- since the firm's September survey. Again, Missouri is not competitive. Rather, it is firmly lodged in the Lean Romney category, having swung back toward the Republicans by about seven points since 2008. The Old North state remains close if not competitive at the presidential level, but Mitt Romney has maintained an edge in every post-debate poll in the field completely after the debate there. In those four polls, the raw average margin by which Romney leads is just more than four points. That would put North Carolina into the Lean Romney category; close, but not close enough for the president unless there is not only a leveling off of the current trajectory of polling, but a reversal. Even that likely won't be enough. Pennsylvania has closed as well. 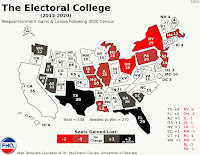 But the narrowing in the polls in the Keystone state has reduced the average there far less than in some other, slightly more competitive states. Given the raw, post-debate average, Pennsylvania is roughly analogous to North Carolina; potentially reachable for, in this case, Romney, but likely just out of reach to the governor. Both Pennsylvania and Michigan are in the same boat and are an awful lot like New Jersey in 2004 to the Bush campaign. Close enough to warrant some thought about resource expenditure, but most likely just a tease in terms of the probability of actually winning either on election day. Like Florida above, Mitt Romney has led in all but two post-debate Virginia surveys. Also like Florida, the FHQ weighted average margin continues to track down closer to parity between Obama and Romney. The post-debate average gives just a 0.3 point lead over the president to Governor Romney. 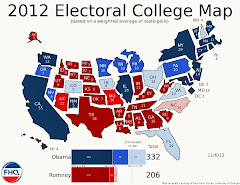 Nothing much changed across either the map above or Electoral College Spectrum below. However, if there are three states that make FHQ uncomfortable about where our averages currently have the race, it is the Virginia/Colorado/Florida group. As mentioned just a few days ago, if the weighted average formula is not as reactive as we would like, it is affecting things at the margins in those three states especially. The data suggests the average is heading into Romney territory in each, but the evidence is not strong enough to get it there just yet. Our 2008 adjustment to increase the weight of the most recent poll really has minimal effects. But again, the value of the slow change is that when a change occurs, it is typically a lasting change. And with only three weeks until election day, that is very likely to be the case. 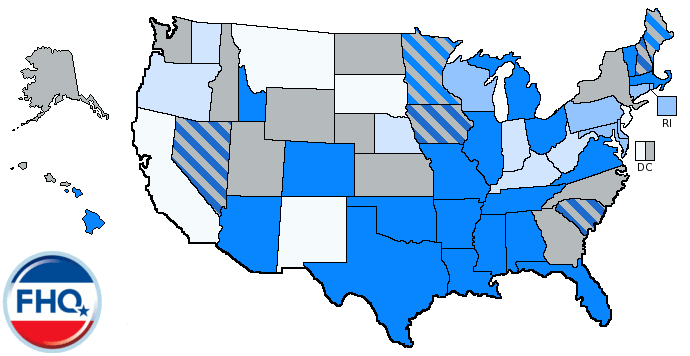 The one minor change on the Spectrum is a Missouri/Tennessee switch among the Lean Romney states. Likewise the Watch List remains unchanged. Florida is on the list, but Colorado and Virginia remain off of it despite a closing margin in the averages overall. The final three entries on the list in addition to those three above are probably the states from which to most watch new polling.